Pulpitis by definition is inflammation of the tooth pulp. The pulp is the inner part of the tooth that consists of blood vessels, nerve endings, lymphatics, and connective tissues. In pets the most common reason for pulpitis is traumatic force to a tooth, either from blunt trauma or chewing on items that are too hard. Typical scenarios seen in dogs are accidental baseball bat swings, golf club swings, hit-by-car injuries, and rough play (or fights) with other dogs. These teeth often appear discolored (pink, purple-to-gray). Similar to a skin bruise, the color change is a result of hemorrhage and the bursting of red blood cells within the tooth. Because the pulp is enclosed within a hard rigid chamber, any inflammation can rapidly increase inner pressure and restrict blood flow. Eventually, pulpitis most often progresses to pulp and tooth death. 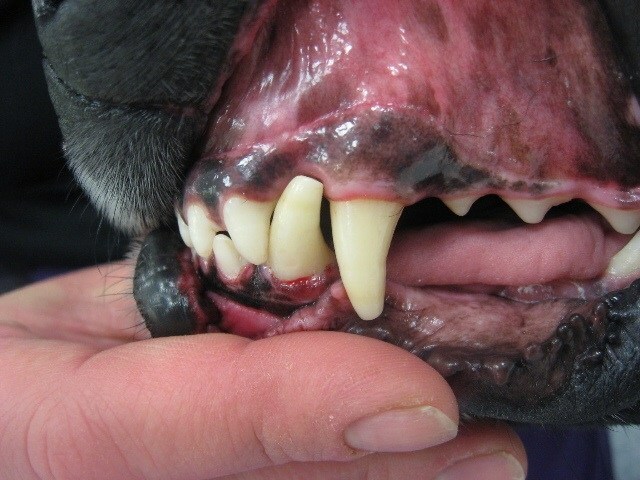 Why should these teeth be treated if our pets don't seem to mind? First, dogs and cats are unreliable at expressing pain. They have too many characteristics handed down to them from their wild ancestors, including a disinclination to display obvious signs of discomfort. People suffering from pulpitis report that the condition is painful! This is especially true in the early acute stages. But even in later chronic conditions, a waxing and waning dull ache may be felt by our pets (again, this is based on what people report). In addition to discomfort, dead or dying teeth are a potential source of infection. Through a process called anachoresis, bacteria naturally found in the bloodstream may be attracted to the area of dead pulp and set up a thriving community. This active bacterial population leads to more inflammation, pain, and can possibly spread to other distant sites. Usually pulpitis can be determined visually. If the tooth appears intrinsically discolored (a color change from within, not on the exterior), then pulpitis has occurred. In addition to a complete oral examination, dental x-rays may be obtained to help assess the tooth status. Unfortunately, in 42% of discolored teeth, x-rays appear normal. Likewise humans experiencing discomfort due to pulpitis do not always show changes on x-rays. 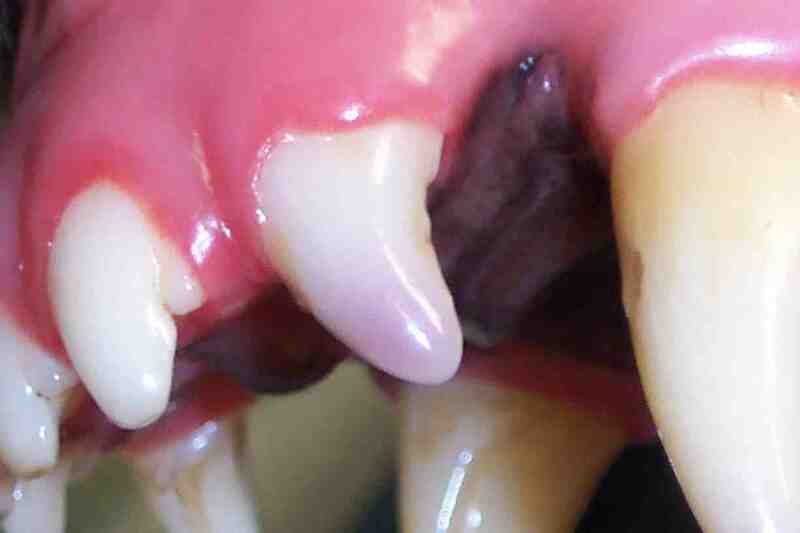 For very young dogs and cats less than a year of age, the prognosis for saving a tooth suffering from reversible pulpitis is better than older pets; in these limited cases anti-inflammatory medications may be of benefit. These teeth need to be monitored long-term (e.g. dental x-rays every 6 months for two years). In most cases, diagnosed pulpitis is irreversible and treatment should be directed toward removing the source of inflammation (i.e. affected pulp). Definitive treatment for affected teeth includes endodontic therapy (root canal therapy) or extraction. Teeth that receive root canal therapy can be restored to a near normal white color by applying a bleach solution at the time of the procedure. 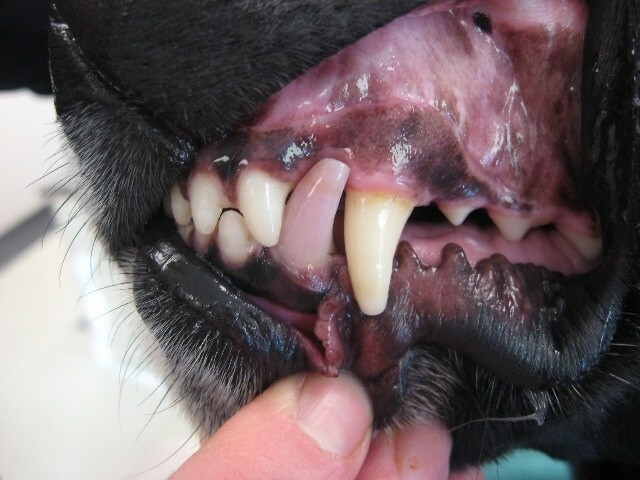 The canine tooth with pulpitis (above left) was treated with root canal therapy then bleaching. The after photo, on the right, shows the same dog with his pearly whites back again.